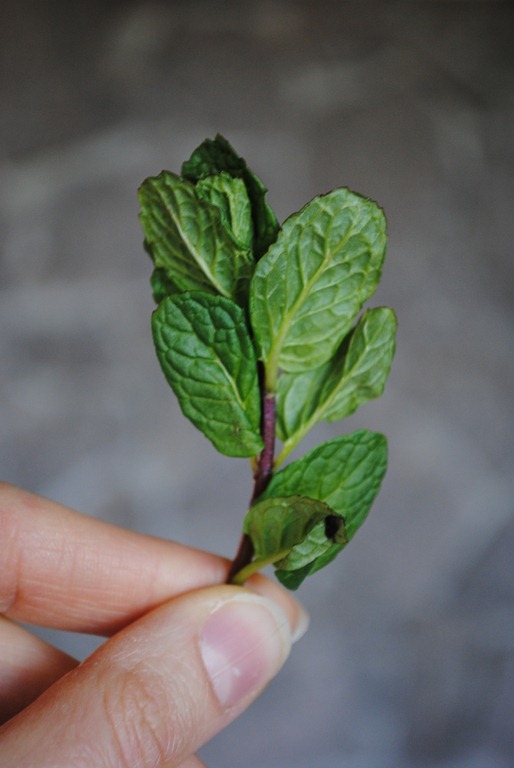 Have you ever grown spearmint in your garden? 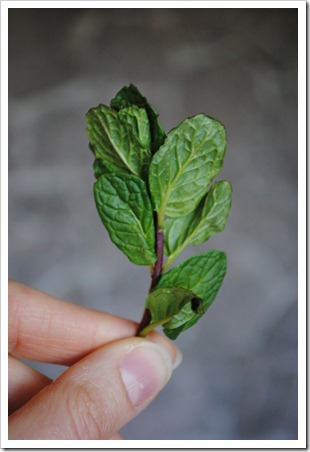 Even if you don’t have a green thumb, spearmint is one of those things that will grow effortlessly without your help. In fact, back in my younger and less informed years, I transplanted some spearmint from a neighbor and watched in amazement as it spread wildly throughout my garden. I then proceeded to dig up a metric ton of mint to try to get rid of it. Now I know: If you want to grow mint, put it in a pot so it is contained! 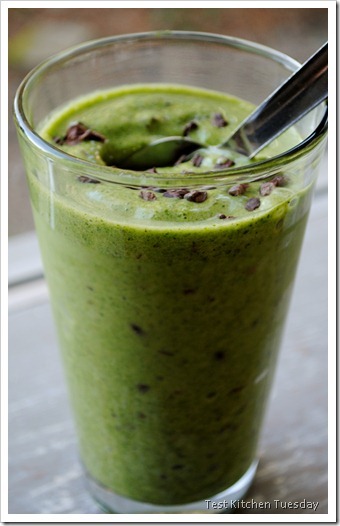 Mint is a delicious addition to a lot of different foods, including green drinks, iced tea, and, this green smoothie. 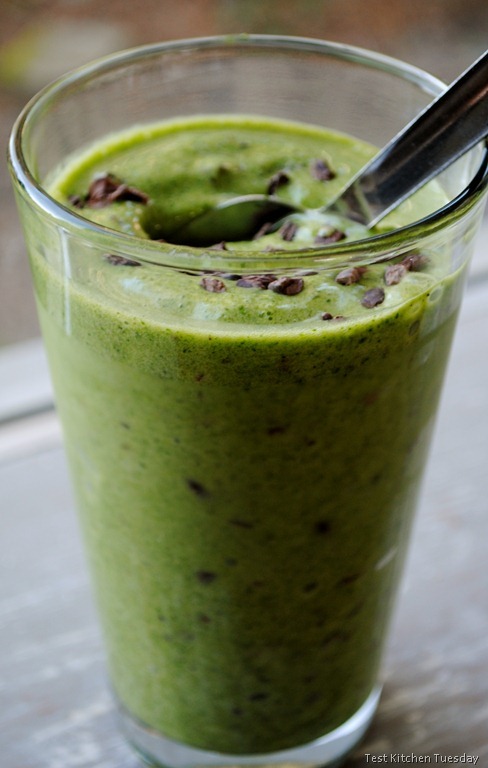 Think of it as mint chocolate chip ice cream meets good-for-you. I used cacao nibs in this recipe, but they definitely have a unique bitterness for those that are uninitiated to them. If you prefer, use your choice of regular or mini chocolate chips. I really encourage the use of a more natural sweetener instead of plain sugar or anything artificial. I do think this recipe needs the sweetener, but make it something like real maple syrup, honey, or coconut sugar. In fact, did you know pure maple syrup has anti-oxidant properties? It also has a decent amount of zinc. I’m not talking about Aunt Jemima here. You need the real stuff to get the benefits! If you use the recipe as I have laid it out, you’ll get lots of natural antioxidants from the spinach, cacao nibs, and maple syrup – a good thing to help keep your body running well. This article explains the benefits of antioxidants, and has a list of the top food sources. Don’t want a smoothie? You could turn this into blender soft serve by adding one more banana and omitting the ice. But, be warned, you may not get the spinach as smooth as you’d like without the ice if you’re using a Ninja Blender due to the blade design. Ice helps break up greens into a smoother consistency. For those that are curious, I made this in the Ninja Pulse, so any of the Ninja blenders should be able to make it just fine. Cacao nibs are an unprocessed chocolate from the cacao bean. They are fairly bitter like dark chocolate. They are high in antioxidants and are a decent substitute for chocolate chips for the health-conscious set. These are the ones I buy: http://amzn.to/15Rl3qw. Warning: If you don’t like dark chocolate, you may not like them! Good response in return of this difficulty with firm arguments and explaining the whole thing concerning that.